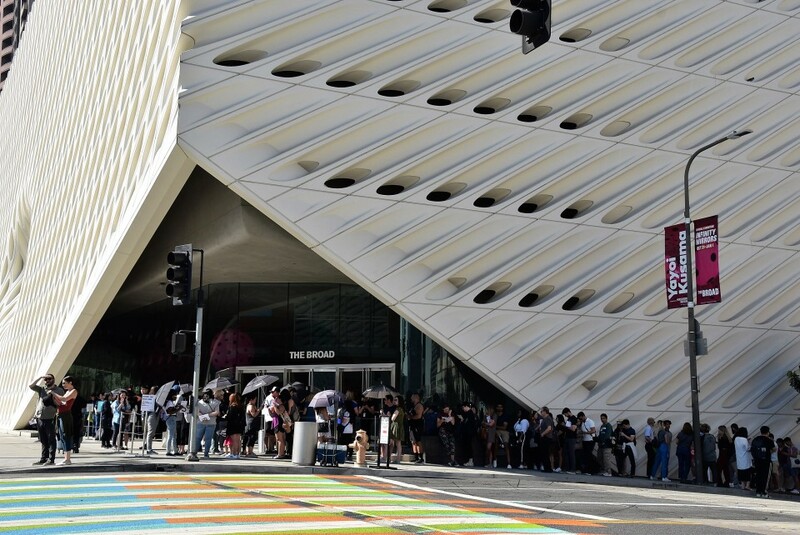 Outside The Broad contemporary museum in downtown Los Angeles, a line of people stretched down an entire block, nearly a week after the sold-out Yayoi Kusama: Infinity Mirrors exhibition opened on Oct. 21. 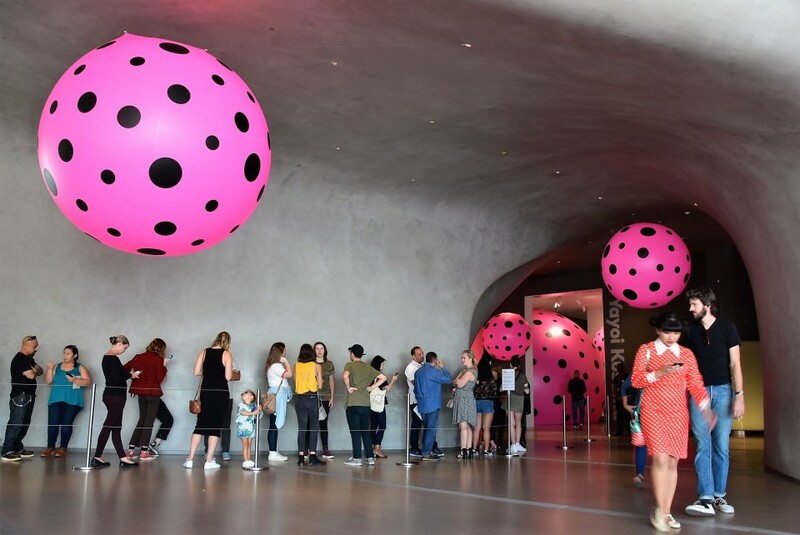 Each day the museum sells a limited number of same-day standby tickets, and during a week in which the city experienced a record-breaking heat wave with temperatures topping 100 F, people had been willing to wait outside for hours in the blistering sun for a chance to enter the Japanese octogenarian artist's polka dot-filled world. Ali Lange, 31, of North Dakota was one of thousands that unsuccessfully attempted to purchase some of the 50,000 tickets when they went on sale online Sept. 1. "The LA Times had published a link that was supposed to be a short-cut to buying tickets," Lange said. The link, it turned out, was faulty, and bumped thousands of people out of the cue. "I had to pull the car over to the side of the road when that happened. I just couldn't believe it." It was not the first time she had missed out on seeing the Kusama exhibit. "I waited in Washington, D.C., for about four hours in the rain when it was there and didn't get in." The Broad subsequently released 40,000 additional tickets on Oct. 2. Those also sold out within hours. The museum then announced that a limited number of standby tickets would be made available each day throughout the entire exhibit's run. Admission to The Broad's permanent galleries is free. But for this special exhibit, advance tickets sold for $25, while standby tickets are $30. The Broad is home to one Kusama "Infinity Mirror" room in its permanent collection. "Infinity Mirrored Room -- The Souls of Millions of Light Years Away," which opened in September 2015, is the most popular attraction at the museum. Katy Perry posted a photo on Instagram of herself inside it, and Grammy Award-winning singer-songwriter Adele even used it as the location for her music video "When We Were Young." The ephemeral nature of Kusama's latest kaleidoscopic visionary art, on view through Jan. 1, has heightened interest, bringing people from around the country to see it. One of the first people in the standby line on this Friday, Oct. 27, Saboor Shad, 34, had been in line since 7 a.m. He learned about Yayoi Kusama by seeing photos on Instagram. "Since I'm visiting from Philadelphia, I thought we'd come down early and try to see it." Just behind him stood a couple from Reno, Nevada, who had tried twice to buy tickets online. "We decided to take advantage of a Nevada state holiday and use the three-day weekend to take a trip here. My husband is an artist so we know about Kusama and her work," said Mona Buckheart, 66. Cady Stark of Los Angeles said she was willing to take a chance and got in line around 8:30 a.m. "I love art installations, and Yayoi Kusama makes the best ones. She's one of my favorite artists. I like how she uses her art as a coping mechanism to deal with her mind," said Stark, 23. "I'm a photographer, so I'm a visual person. I like how (Kusama) manipulates color and perspective in order to make you feel like you are in a different world," said Los Angeles resident Christopher Riviero, 34. James McMinn from St. Louis also said he loves the surreal quality of Kusama's art. "It's an escape from reality. It confuses your senses," said McMinn, 36. Carla Becker, a psychotherapist from Los Angeles, agreed. "I think that's the attraction of her art. It's an experience," said Becker, 56, who tried twice online to buy tickets. "I'm a novice to her and want to experience it for myself." For Lange, the third time was a charm. She and her four friends from college got in the standby line at 8:30 a.m. By 10:30 a.m., they were on their way into the museum. Ticket firmly in hand, she said it felt like a real achievement. Then she added, "This art better be good." Her friends all laughed.